As the new BBC America crime drama COPPER shows, 1860s New York was a dangerous, backstabbing place. And the real-life 1864 murder of "John Smith", whose body was chopped up, packaged and dropped into the East River, went unsolved—and his identity a mystery— for seven years until the killers confessed half a world away. The first package containing the torso of victim, actually named Joseph Smith, was found on October 3, 1864, by the Brooklyn Navy Yard. The second package, with his "pelvic region," was found on October 9, by the Corlears Street wharf (about Cherry Street and the FDR today); the third package (Smith's thighs) washed up in Gravesend on the 10th; the fourth package, the booted feet, emerged in Bay Ridge on the 13th and, on the 17th, Smith's head, with bullet wounds, was found in Fort Hamilton. However, police did not know who the victim was. They photographed the man's head and sent it and a description of the man to police stations around the country. In the meantime, the police also preserved the head in a jar and kept it in the "dead-house." Thousands of people, perhaps lured by the coverage of the sick killing or perhaps to truly see if this could be a missing relative, visited the head and more than two dozen people identified the victim as a friend or relative. One woman insisted it was her husband—when she was shown the victim's socks, she swooned—and the Five Points Mission minister who married the couple said the victim was definitely her husband... expect then the minister realized that marriage occurred after the body had been found. A government detective also emerged and suggested that the victim was Joseph Smith, a sergeant-major in Regiment F. He was also apparent Army deserter, who had been granted leave in January of 1864, but hadn't been seen by his wife since the fall of 1862. The detective learned that Smith's brother saw him, very drunk, in Fort Green Park before October 1864. The brother scolded him and encouraged him to re-enlist, but his friends continued to see him in the company of bad characters. The detective showed a photograph of the victim's head to Smith's friends, many of whom said it was definitely Smith, but his widow refused to positively identify him. Seven years later, in 1871, three men were arrested in Sydney, Australia, after a terrible brawl. 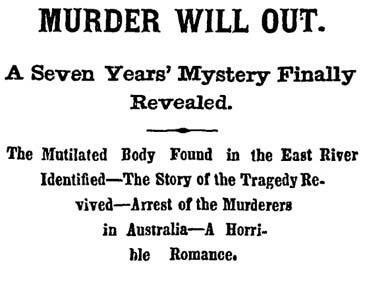 One of the men confessed to numerous crimes, including Smith's murder. Smith loved to drink and had fallen in with these men, who convinced him to re-enlist but then "jump the bounty"—as in, take $300 from the army and not show up. The confessed killer said he and his two associates had been carousing with Smith on October 2, 1864, at various saloons on Mercer and Green Streets. 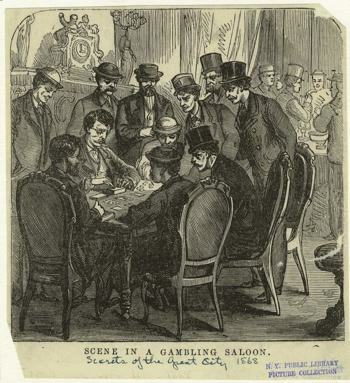 They had all been gambling, except Smith, who still had his $300 left. So the three men led Smith to an alley on Prince Street and into a workshop where one had worked, attacking him, shooting him in the head and taking his money. Then they carved his body, wrapped the pieces, and drove to Brooklyn, dumped his body from the Willamsburg waterfront and then set off for Australia. In 1871, the NY Times complained that the police could have figured out who the murder victim was if they had bothered to follow up on the government detective's hunch that it was Joseph Smith: "The story is now so clear, in fact, that one is led to wonder that the mystery has so long remained a mystery that it was not at once cleared up." Thanks for the hundreds of readers who entered! We did select a winner—from the D.C. area, in fact!—who will receive a new 32GB iPad with Retina Display, a season pass to watch Copper, and a reproduction 1864 map of New York City! The bad, very old days are back in BBC America's COPPER. New episodes every Sunday at 10/9c, only on BBC America. For more updates on the series, be sure to like COPPER on Facebook and follow COPPER on Twitter. Shot of Woody Allen filming in the Inner Richmond by Justin Beck.